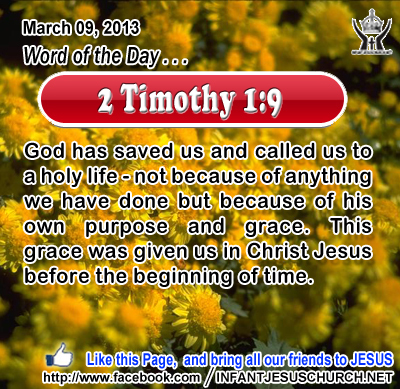 2 Timothy 1:9: God has saved us and called us to a holy life - not because of anything we have done but because of his own purpose and grace. This grace was given us in Christ Jesus before the beginning of time. Heavenly Father, thank you so much, for knowing us and thinking of our needs even before there was a world. We dedicate this day, the days that follow, to your honor as we try to live a life that reflects your righteousness and grace. In the name of Infant Jesus, the one who had no sin, we pray. Amen. 9He also told this parable to some who trusted in themselves that they were righteous and despised others: 10"Two men went up into the temple to pray, one a Pharisee and the other a tax collector. 11 The Pharisee stood and prayed thus with himself, `God, I thank thee that I am not like other men, extortioners, unjust, adulterers, or even like this tax collector. 12I fast twice a week, I give tithes of all that I get.' 13But the tax collector, standing far off, would not even lift up his eyes to heaven, but beat his breast, saying, `God, be merciful to me a sinner!' 14I tell you, this man went down to his house justified rather than the other; for every one who exalts himself will be humbled, but he who humbles himself will be exalted." This parable presents both a chance and a warning. Pride leads to illusion and self-deception. Humility helps us to see ourselves as we really are and it predisposes us to God's grace and mercy. God dwells with the humble of heart who distinguish their own sinfulness and who acknowledge God's mercy and saving grace. We dwell in the high and holy place, and also with him who is of a repentant and humble spirit. God cannot listen to us if we despise others. Do we humbly seek God's compassion and do we show mercy to others, especially those we find difficult to love and to forgive? Loving Infant Jesus, may your love control our thoughts and actions that we may do what is pleasing to you. Show us where we lack charity, mercy, and forgiveness toward our neighbor. And help us to be generous in giving to others what you have so generously given to us.